A joint operation conducted by the Department of Immigration and Emigration and the Police has resulted in the arrest of 108 foreign workers sleeping in a cramped room. The operation was conducted last Saturday night. Controller of Immigration Dr. Mohamed Ali told Sun today that 101 Bangladeshis and 7 Indian national were arrested from a 500 square foot room located inside Ma. Kismireege, Male’. “In light of information we had received, we organized a raid with the help of the police and picked up 108 people from a 500 square foot room inside a house called Ma. Kismireege, cramped up and sleeping, stacked. It is by no means acceptable to be cramped in to such small places,” said the Controller. He said the majority of foreign workers brought into the country do not possess any working skills. “People in the unskilled category especially, have increased. 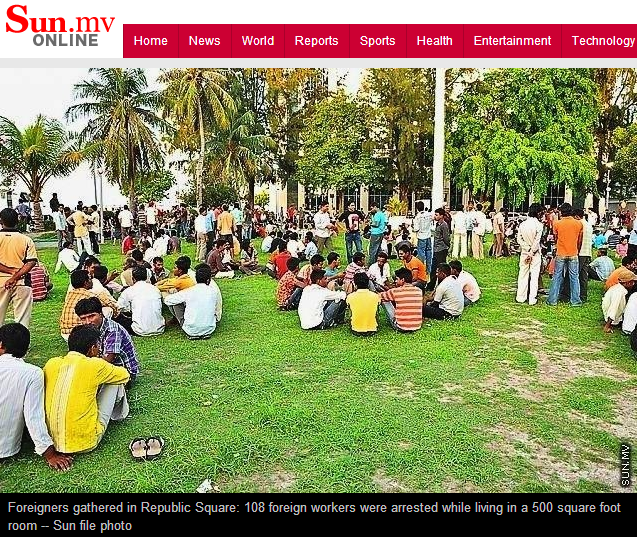 (Statistics) show that there were about 80,000 foreigners in the Maldives at the end of 2008. But the statistics collected at the end of February this year shows that there are about 111,500 people registered. We estimate that 40,000 to 50,000 people are unregistered, which means a population of about 160,000 people,” Dr. Mohamed Ali said. Regardless of the exceptionally high expatriate population and the extreme conditions they face, more and more foreigners keep coming into the country each day. Department of Immigration earlier revealed that the number of registered foreigners in the country stood at 160,000 at the end of 2012. Latest numbers show that Maldives has a population of approximately 360,000 people. You may now proceed to answer the questions.